There are books that entertain you, completely capture your attention AND provoke you into thinking about some of the bigger dilemmas in life. 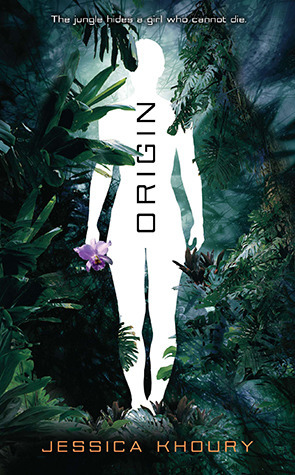 Origin was one such book for me, entertaining me with its beautiful descriptions of the Amazon, and a vividly told story, all the while also making me ask questions about morality and science and what it truly means to be human. I happen to like thinking about ethical issues at times, and Origin provided the perfect opportunity to do that. There’s a big overall conflict being addressed here – a conflict between science and morality. The scientists in this book represented the scientific side, where anything and everything is done in the name of science and progress. Pia and a couple of others, on the other hand, represented a questioning of this belief as their morality and values kicked in. I love this argument guys, because I feel like it’s something that’s common in our society these days. Jessica Khoury deserves total props for being able to wind such a large ethical conflict into a story without being preachy. That being said, we discover that an evil plot is afoot towards the middle of the book, which pretty much throws all this thought of ethical argument out of the window – and to me, it wasn’t a bad thing. I like having a villain in my books, mostly because I feel books without villains (or an antagonizing situation or thing) are incomplete and less enjoyable. The villain in this book is fairly predictable after a certain point, but it still horrified me to read about what he did, what he does and what he was planning to do. Effective villain, check! Pia is certainly an interesting character to read about. Her superhuman skills are definitely amazing (and I’d give anything to have her memory! ), but what really drew me to her was when she started feeling the need to “get out” of Little Cam. I could totally relate to that burning desire to escape and explore, and I pretty much cheered her on when she found a way outside the fence. Apart from evoking nostalgia about my first year in college when I felt much the same way, I also love that it subtly hints at the fact that moving outside of your boundaries (whether you were placed in them or self-imposed) often leads to discoveries and revelations about who you are. I also loved the setting that Jessica Khoury chose for this book – the Amazon. I’ve always been extremely curious about the place, if slightly intimidated by the thought of it. But it was so beautifully and hauntingly described in Origin, and that makes me really want to go and see it for myself. One more thing – I loved the mention of jaguars and ocelots. I would like one of my very own now, thank you very much. Origin was thought-provoking, interesting and really different from anything that I’ve read before. I genuinely loved the settings, was pretty invested in the character and find myself to be a huge fan of the style Jessica Khoury employed when tackling this conflict between science and morality. If Origin is any indication of her writing style and her story ideas, Jessica Khoury is definitely going to be one author that I’m watching out for! I also really enjoyed the setting of this novel. It was very unique. I agree - this was such a unique idea that was entertaining, but also made you think. I also wish that I had Pia's memory! ha! I'm looking forward to reading this one, Alexa. I love reading about the jungle because it's so totally foreign to me, it's like reading about another planet. But I'm intrigued by this ethical dilemma, too. Reading a book that is solid adventure and entertainment can be awesome, but I think books are always a little better if there is some issue at hand as well. Something that gives the characters and the readers pause. Origin sounds like it has both. Yay!! There was a lot that I enjoyed about this book, particularly the lush descriptions, but there was also some things that just didn't work for me. But her technical writing skills for a debut are quite impressive and I'm really looking forward to seeing what she does in the future. And, yeah, effective villain - definitely a check. There are really, really lush descriptions - I loved how the Amazon was portrayed and the way of life inside the research facility. ...that being said, if you are easily annoyed by Instalove (like I am), you will HATE the romance between Eio and Pia. So unrealistic. They've known each other a WEEK, and he is LITERALLY the first teenage boy she's ever met. The science vs. morality was an interesting argument, though, although I felt they could have been less black and white about it. Morality and science can co-exist. Oooo, this sounds like something I would really enjoy. I love thought provoking books, and the setting sounds fabulous. :) Thanks for the awesome review Alexa! This looks like such a good read ... and I love the cover! It's always great to find a book that actually makes you THINK! I'll definitely have to check it out! This sounds so great! I love it when an author can do this: "Jessica Khoury deserves total props for being able to wind such a large ethical conflict into a story without being preachy." This really does sound like an interesting read! I also love when books can make you think about morality/ethics/etc. but aren't in your face, you know? So when you mentioned that I was instantly interested! Great review Alexa!